This article is about the association football club from Milton Keynes, formed under this name in 2004. For its origins, see Wimbledon F.C. and Relocation of Wimbledon F.C. to Milton Keynes. For the women's team, see Milton Keynes Dons L.F.C. Initially based at the National Hockey Stadium, the club competed as Milton Keynes Dons from the start of the 2004–05 season. After two seasons in League One, they were relegated to League Two in 2006. The club moved to their current ground, Stadium MK, for the 2007–08 season, in which they won the League Two title and the Football League Trophy under the management of Paul Ince. After seven further seasons in League One, the club won promotion to the Championship in 2015 under the management of Karl Robinson; however, they suffered relegated back to League One after one season. Milton Keynes Dons have built a reputation for youth development, run 16 disability teams and their football trust engages around 60,000 people; between 2012 and 2013 the club produced 11 young players who have been called into age group national teams and between 2004 and 2014 the club gave first-team debuts to 14 local academy graduates, including the England international midfielder Dele Alli. The club also runs a women's association football side, Milton Keynes Dons L.F.C. Milton Keynes, about 45 miles (72 km) north-west of London in Buckinghamshire, was established as a new town in 1967. In the absence of a professional football club representing the town—none of the local non-league teams progressed significantly through the English football league system or "pyramid" over the following decades—it was occasionally suggested that a Football League club might relocate there. There was no precedent in English league football for such a move between conurbations and the football authorities and most fans expressed strong opposition to the idea. Charlton Athletic briefly mooted moving to "a progressive Midlands borough" during a planning dispute with their local council in 1973, and the relocation of nearby Luton Town to Milton Keynes was repeatedly suggested from the 1980s onwards. Another team linked with the new town was Wimbledon Football Club. Wimbledon, established in south London in 1889 and nicknamed "the Dons", were elected to the Football League in 1977. They thereafter went through a "fairytale" rise from obscurity and by the end of the 1980s were established in the top division of English football. Despite Wimbledon's new prominence, the club's modest home stadium at Plough Lane remained largely unchanged from its non-league days. The club's then-owner Ron Noades identified this as a problem as early as 1979, extending his dissatisfaction to the ground's very location. Interested in the stadium site designated by the Milton Keynes Development Corporation, Noades briefly planned to move Wimbledon there by merging with a non-league club in Milton Keynes, and bought debt-ridden Milton Keynes City. However, Noades then decided that the club would not gain sufficient support in Milton Keynes and abandoned the idea. In 1991, after the Taylor Report was published recommending the redevelopment of English football grounds, Wimbledon left Plough Lane to groundshare at Crystal Palace's ground, Selhurst Park, about 6 miles (9.7 km) away. Sam Hammam, who then owned Wimbledon, said the club could not afford to redevelop Plough Lane and that the groundshare was a temporary arrangement while a new ground was sourced in south-west London. A new stadium for Wimbledon proved difficult to achieve. Frustrated by what he perceived as a lack of support from Merton Council, Hammam began to look further afield and by 1996 was pursuing a move to Dublin, an idea that most Wimbledon fans strongly opposed. Hammam sold the club to two Norwegian businessmen, Kjell Inge Røkke and Bjørn Rune Gjelsten, in 1997, and a year later sold Plough Lane to Safeway supermarkets. Wimbledon were relegated from the Premier League at the end of the 1999–2000 season. Starting in 2000, a consortium led by music promoter Pete Winkelman and supported by Asda (a Walmart subsidiary) and IKEA proposed a large retail development in Milton Keynes including a Football League-standard stadium. The consortium proposed that an established league club move to use this site; it approached Luton, Wimbledon, Crystal Palace, Barnet and Queens Park Rangers. In 2001 Røkke and Gjelsten appointed a new chairman, Charles Koppel, who was in favour of this idea, saying it was necessary to stop the club going out of business. To the fury of most Wimbledon fans, Koppel announced on 2 August 2001 that the club intended to relocate to Milton Keynes. After the Football League refused permission, Wimbledon launched an appeal, leading to a Football Association arbitration hearing and subsequently the appointment of a three-man independent commission to make a final and binding verdict. The league and FA stated opposition but the commissioners ruled in favour, two to one, on 28 May 2002. Having campaigned against the move, a group of disaffected Wimbledon fans reacted to this in June 2002 by forming their own non-league club, AFC Wimbledon, to which most of the original team's support defected. AFC Wimbledon entered a groundshare agreement with Kingstonian in the borough of Kingston upon Thames, adjacent to Merton. The original Wimbledon intended to move to Milton Keynes immediately but were unable to do so until a temporary home in the town meeting Football League criteria could be found. The club remained at Selhurst Park in the meantime and in June 2003 went into administration. With the move threatened and the club facing liquidation, Winkelman decided to buy it himself. He secured funding for the administrators to keep the team operating with the goal of getting it to Milton Keynes as soon as possible. The club arranged the temporary use of the National Hockey Stadium in Milton Keynes and played its first match there in September 2003. Nine months later Winkelman's Inter MK Group bought the club out of administration and announced changes to its name, badge and colours—the team was renamed Milton Keynes Dons Football Club. The first season for the club as Milton Keynes Dons was 2004–05, in Football League One, under Stuart Murdoch, who had managed Wimbledon F.C. since 2002. The team's first game was on 7 August 2004, a 1–1 home draw against Barnsley, with Izale McLeod equalising with their first competitive goal. Murdoch was sacked in November and replaced by Danny Wilson, who kept Milton Keynes Dons in the division on the final day of the season — but only because of Wrexham's 10-point deduction for going into administration. The following season, Milton Keynes Dons struggled all year, and were relegated to League Two; Wilson, as a result, was sacked. Wilson's successor for 2006–07 was Martin Allen, who had just taken Brentford to the brink of a place in the Football League Championship. Milton Keynes Dons were in contention for automatic promotion right up to the last game of the season, but eventually finished fourth and had to settle for a play-off place. They then suffered a defeat to Shrewsbury Town in the play-off semi-finals. During the 2007 summer break, Allen left to take over at Leicester City. For the 2007–08 season, former England captain Paul Ince took over as manager. Milton Keynes Dons reached the final of the Football League Trophy, while topping the table for most of the season. The final was played on 30 March 2008 against Grimsby Town — Milton Keynes Dons won 2–0 at Wembley to bring the first professional trophy to Milton Keynes. The club capped the trophy win with the League Two championship, and the subsequent promotion to League One. Following his successes, Ince left at the end of the season to manage Blackburn Rovers. Ince's replacement was former Chelsea player Roberto Di Matteo, taking his first role as a manager. In the 2008–09 season, they missed out on an automatic promotion spot by two points, finishing third behind Peterborough United and Leicester City. They were knocked out of the play-offs by Scunthorpe United, who defeated MK Dons by penalty shootout at Stadium MK. Di Matteo left at the season's end for West Bromwich Albion. A year after leaving, Ince returned as manager for the 2009–10 season. He resigned from the club on 16 April 2010, but remained manager until the end of the season. On 10 May 2010, Karl Robinson was appointed as the club's new manager, with former England coach John Gorman as his assistant. At 29 years of age, Robinson was at the time of his appointment the youngest manager in the Football League. In his first season in the club Milton Keynes Dons finished fifth in 2010–11 League One. They faced Peterborough United in the play-off semifinals. Although they won the first leg 3–2, a 2–0 defeat at London Road meant they missed out on the play-off final. The 2011–12 season brought similar results to the previous season with the Dons finishing fifth in 2011–12 League One facing Huddersfield in the play-offs. Losing the first leg 2–0 followed by winning 2–1 at The Galpharm saw Milton Keynes Dons lose 3–2 on aggregate against the eventual play-off winners. The away leg was John Gorman's last match in football after announcing his retirement a few weeks beforehand. Gorman's replacement was announced on 18 May 2012 as being ex-Luton manager Mick Harford along with new part-time coach Ian Wright. Milton Keynes Dons experienced their best ever FA Cup campaign in the 2012–13 season by beating a spirited Cambridge City (0–0 and 6–1), League Two fierce rivals AFC Wimbledon (2–1), Championship Sheffield Wednesday (0–0 and 2–0) and Premier League Queens Park Rangers (4–2) to reach the fifth round of the competition for the first time ever in their history. Their record-breaking run ended in the fifth round at stadium:mk on 16 February 2013, losing 3–1 to Championship side Barnsley. After being in the top five for most of the season, the club finished the 2013–14 League One season in tenth place. The 2014–15 season began well. The highlight event of the season's first month was being drawn against Manchester United in the League Cup second round, having dispatched AFC Wimbledon in the first. The Dons recorded a shock 4–0 victory over Manchester United in front of a sell out crowd at stadium:mk. A few weeks later, the Dons recorded their record win, a 6–0 thrashing of Colchester United at home. That record did not last long as it was broken once again with a 7–0 demolition of Oldham Athletic on 20 December 2014. Just over a month later, on 31 January 2015, the Dons recorded a joint record 5–0 away win against Crewe Alexandra, earning a short-lived top spot. On 3 May the club secured promotion to the Football League Championship for the first time, beating Yeovil Town 5–1 and leapfrogging Preston North End (who lost 1–0 at Colchester United) on the final day of the season. On 23 October 2016, Karl Robinson left the club by mutual consent, following a 3–0 home to defeat to Southend United the previous day, which had extended the Dons' winless run to four games and left them 19th in the League One table. Robbie Neilson joined MK Dons as manager from Scottish Premiership club Heart of Midlothian in his native Scotland, with his first official game in charge coincidentally an FA Cup tie against Karl Robinson's new club Charlton Athletic. Neilson's reign started off well, with his second game in charge a win over AFC Wimbledon, and in late January 2017 a local derby win against Northampton Town. The following season started badly, however on 30 December 2017 the team was noted for a remarkable 1–0 derby win against Peterborough, playing with 9-men for 68 minutes after controversial refereeing decisions and 13 minutes of added time. Neilson left by mutual consent on 20 January 2018 after a run of one win in eleven league games with the club 21st in the table; he was sacked the same day as his last game, a disappointing away 2-1 derby defeat against relegation rivals Northampton Town. Under Neilson's successor Dan Micciche, the club continued to struggle in the relegation places. Following a run of poor results with only three wins in sixteen matches in charge, Micciche left the club on 22 April 2018, with assistant manager Keith Millen taking over as a caretaker. On the penultimate weekend of the season another defeat mathematically relegated them to League Two (leaving them seven points from safety with one game to play). Former Exeter City manager Paul Tisdale was appointed in June 2018 after 12 years at his previous club. Only seasons played by Milton Keynes Dons under that name are given here. For a kit history of Wimbledon F.C., see Wimbledon F.C.#Kit history. The club's first stadium was the National Hockey Stadium, which was temporarily converted for football for the duration of the club's stay. Their lease on the venue ended in May 2007. On 18 July 2007, the club's new 30,500 capacity stadium, Stadium MK in Denbigh hosted its first game, a restricted-entrance event against a young Chelsea XI. The stadium was officially opened on 29 November 2007 by Queen Elizabeth II. The stadium features an open concourse at the top of the lower tier, an integrated hotel with rooms looking over the pitch and conference facilities. The complex was to include a 3,000 capacity indoor arena, where the MK Lions basketball team would be based, but completion of this arena was delayed due to deferral of proposed commercial developments around the site. In May 2009, the stadium was named as one of 15 stadia put forward as potential hosts for the England 2018 FIFA World Cup bid, which would include increasing capacity to 44,000. England's bid was unsuccessful, but Stadium MK went on to be one of stadia for the Rugby World Cup 2015. The Dons' most famous non-football related supporter was local resident Jim Marshall, the founder of Marshall Amplification, who were one of the earliest shirt-sponsors. Racing driver Dan Wheldon was also reported to be a fan; after his death, a minute's silence was held in his memory before the next game's kickoff, against Scunthorpe. Former cricketer and talkSport radio presenter Darren Gough, despite being a Barnsley F.C. fan, attends Dons games from time to time as he lives nearby, and also frequently speaks of the Dons when presenting on the radio. Other notable fans who are either Dons fans or regularly attend games are: Gabi Downs, Paralympic fencer; Andrew Baggaley, table tennis Commonwealth Games double gold medallist; Gail Emms, badminton world champion; James Hildreth and James Foster both England cricketers; Mark Lancaster, local member of parliament and government minister in 2012; Craig Pickering, 100m sprinter – bronze medal at the World Championship in 2007; Craig Gibbons, London 2012 Olympic 100 metre swimmer; Mikey Burrows, Sky Sports Radio presenter; and the late musician and radio broadcaster George Webley. On 4 June 2005, at the 2005 Football Supporters' Federation "Fans' Parliament" (AGM), the FSF refused the Milton Keynes Dons Supporters Association membership of the FSF in a debate that, among other arguments, questioned why the Football League had yet to introduce any new rules to prevent the "franchising" of other football clubs in the future. In addition, the FSF membership agreed with the Wimbledon Independent Supporters' Association that the Milton Keynes Dons Supporters Association should not be entitled to join the FSF until they give up all claim to the history and honours of Wimbledon FC. With this in mind, the FSF began discussions aimed at returning Wimbledon FC's honours to the London Borough of Merton. At its AGM on 5 June 2006, the FSF again considered a motion proposed by the FSF Council to allow Milton Keynes Dons Supporters Association membership if the honours and trophies of Wimbledon FC were given to the London Borough of Merton. In October 2006, agreement was reached between the club, the Milton Keynes Dons Supporters Association, the Wimbledon Independent Supporters' Association and the Football Supporters Federation. The FA Cup trophy plus all club patrimony gathered under the name of Wimbledon F.C. would be returned to the London Borough of Merton. Ownership of trademarks and website domain names related to Wimbledon F.C. would also be transferred to the borough. As part of the same deal it was agreed that any reference made to Milton Keynes Dons FC should refer only to events subsequent to 7 August 2004 (the date of the first League game of Milton Keynes Dons FC). As a result of this deal, the FSF announced that the supporters of Milton Keynes Dons FC would be permitted to become members of the federation, and that it would no longer appeal to the supporters of other clubs to boycott Milton Keynes Dons' matches. On 2 August 2007, Milton Keynes Dons transferred ownership of all Wimbledon FC trophies and memorabilia to the London Borough of Merton. MK Dons have a rivalry with Peterborough United , since the two clubs have vied head-to-head for promotion to the Championship. There also exists between MK Lightning and Peterborough Phantoms in ice hockey a rivalry that pre-dates the one in football. The relegation of the Dons means they will not face each other in league play in 2018-19. Northampton is geographically the closest urban area to Milton Keynes with a professional football team, Northampton Town, the two places separated by a little over 20 miles (32 km). MK Dons supporters' association chairman John Brockwell has stated that the fans were looking forward to hosting Northampton, the club that, geographically at least, are their nearest rivals. Although Peterborough have been traditionally Northampton's main rivals, the "Cobblers" spokesman has stated, in 2008, that, "with MK Dons now on the fixture list, it gives [Northampton] supporters the chance to develop another rivalry." In January 2016 police arrested a Dons fan for setting off pyrotechnics in the away end, furthermore two Northampton fans and three more Dons fans were ejected from the ground. In 2018, before the 30 January 3pm kick-off in the League One game between the two clubs, Northamptonshire Police arrested seven travelling supporters of the Dons, with one Northampton fan also arrested. Four arrests were for public order offences, one for criminal damage, one for pitch encroachment, one for obstructing the police, and one for affray. Due to their shared ancestry in Wimbledon F.C., there is an unavoidably acrimonious rivalry with AFC Wimbledon since the relocation of Wimbledon F.C. to Milton Keynes; AFC Wimbledon was the club created in 2002 by disaffected supporters of Wimbledon F.C. Dons chairman Pete Winkelman initially stated that MK Dons were the rightful inheritors, writing in November 2004 that "MK Dons and AFC Wimbledon share the same heritage, but we're the real child of Wimbledon"
The first fixture between MK Dons and AFC Wimbledon took place in the second round of the 2012–13 FA Cup, where they were drawn to play each other at Stadium MK. Milton Keynes Dons won the match, held on 2 December 2012, by two goals to one, with a winner scored in injury time, scored by Jon Otsemobor and dubbed by MK Dons fans as "The Heel of God" (a reference to Maradona's "Hand of God"). Kyle McFadzean's opening goal for MK Dons in the second match between the two clubs, a 3–1 MK win in the first round of the League Cup in August 2014, was also scored with his heel, and was consequently labelled "Heel of God II". Two months later, in the Football League Trophy Southern section second round, AFC Wimbledon defeated MK Dons 3–2 with a winning goal by Adebayo Akinfenwa. On 10 December 2016, the sides met for the first time in a competitive league fixture following MK Dons' relegation from the Championship and AFC Wimbledon's promotion from League Two the previous season. Milton Keynes Dons won 1–0, with Dean Bowditch scoring the only goal of the game with a 63rd minute penalty. The first visit of MK Dons to AFC Wimbledon's home ground for a League One match on 14 March 2017 resulted in a 2–0 victory for AFC Wimbledon. In 2017, AFC Wimbledon, in the club's programme for their home game against the Dons, held on 22 September, failed to recognise their opponents by their full name for the second successive season. AFC's official Twitter feed also referred to their opponents as "Milton Keynes" throughout their match coverage. AFC Wimbledon were subsequently threatened by the EFL with disciplinary action, and eventually charged for breaching EFL regulations. The charges were dropped. The relegation of MK Dons means they will not face each other in league play in 2018–19. Wycombe Wanderers are the only other professional team in Buckinghamshire, therefore games between the two teams are labelled "the Bucks derby." They have not played in the same division since 2012 and will not be doing so in 2018-19. Milton Keynes Dons' work in the community was recognised by the award of Football League Awards Community Club of the Year for London and the South East for 2012, and in the award of an honorary doctorate to chairman Pete Winkelman by the Open University in June 2013. Thanks to the co-operation with the University of Bedfordshire (which is partly based in Milton Keynes), Dons match highlights are shown free of charge on YouTube. Striker Sam Baldock was the first notable academy graduate who, after making 102 appearances, moved on to West Ham for a seven-figure sum. Since then he became captain of Bristol City and now plays for Reading. As of February 2015[update], Daniel Powell, Tom Flanagan and George Baldock, brother of Sam, all played regularly for the MK Dons first team. 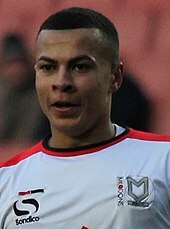 On 2 February 2015, Milton Keynes Dons academy graduate and first team midfielder Dele Alli was sold to Premier League side Tottenham Hotspur for a fee in the region of £5 million. Alli became the first Milton Keynes Dons academy graduate to make a full England senior team debut, on 9 October 2015. Kevin Danso is a graduate of the academy who went on to play for Austria and became the youngest player to make a league appearance in FC Augsburg's history, when making his Bundesliga debut. Other notable youth graduates who have gone on to play at a higher level include George Williams, Brendan Galloway, Scotland international Liam Kelly and England youth team international Sheyi Ojo. On 9 August 2016 in a first round EFL Cup match versus Newport County, manager Karl Robinson selected a first-team squad composed of 13 academy graduates and players, giving eight of those players their full debuts for the club including Brandon Thomas-Asante. The game ended with a 2–3 away win for the club. For a list of all Milton Keynes Dons players, past or present, see Category:Milton Keynes Dons F.C. players. Dean Lewington, the present captain of MK Dons, has played more matches for the team than any other player. Pictured in 2011, he is, as of October 2017, the only former Wimbledon player left in the club's squad. Mark Wright finished the 2007/08 season as the club's top goalscorer, helping the Dons win both the League Two title and the Football League Trophy. Jon Otsemobor made 44 appearances for the club and scored the winning goal in the first match against AFC Wimbledon with a back-heel that was later dubbed the "Heel of God". Milton Keynes Dons were former Premier League player Jimmy Bullard's last club before his retirement from football, making only three appearances for the club. Similarly Dietmar Hamman made 12 appearances as a player-coach before retiring. Notable players loaned from other clubs were strikers Patrick Bamford, who scored 18 goals in 37 games, Benik Afobe, who became the league's top scorer in just six months, and Ángelo Balanta, whose loan spell lasted three years. Former Ireland international Clinton Morrison and former Premiership players Paul Rachubka and James Tavernier also had short loan spells with the club. Alan Smith, most known for his time at Leeds United and Manchester United, joined the club on loan, signing from Newcastle United before making the move permanent totalling 67 appearances for the club. Other international players who have worn the Dons shirt include Tore André Flo, Ali Gerba, Michel Pensée, Cristian Benavente and Richard Pacquette. Paul Ince, pictured in 2006, managed the club over two spells between 2007 and 2010. The first Milton Keynes Dons manager was Stuart Murdoch, who had previously been manager of Wimbledon. Murdoch only lasted three months into the 2004–05 season before being sacked — his assistant, Jimmy Gilligan, managed the club for a month before Murdoch's replacement was revealed to be Danny Wilson. Wilson managed to keep the team up during the 2004–05 season, but failed to repeat this feat during 2005–06. Following relegation, Wilson was shown the door and replaced with Martin Allen. After Allen's team fell at the play-offs, he left to manage Leicester City. Paul Ince was appointed manager for the 2007–08 season, and proved to be a shrewd appointment as MK Dons won the League Two championship as well as the Football League Trophy. Ince too left after only a season, to become manager of Blackburn Rovers. Former Chelsea player Roberto di Matteo was then appointed in July 2008, his personal first ever managerial position and left after a season to manage West Bromwich Albion. Ince was reappointed in his stead on 3 July 2009. Paul Ince resigned as manager on 16 April 2010, stating "a reduction in funds for next season was the reason behind his decision to leave", although he remained with the club until the end of the 2009–10 season. Karl Robinson was appointed manager on 10 May 2010, having previously been the club's assistant manager under previous boss Paul Ince. At 30 years of age, he was the youngest manager in the Football League and former England coach John Gorman was named his number two. He was also the youngest person to ever acquire a UEFA Pro Licence at the age of 29. At the end of the 2011–12 season Gorman retired and was replaced by former Luton player/manager Mick Harford. At the same time, ex-Arsenal and former England international Ian Wright was also enlisted in a part-time role to provide assistance with coaching duties. In January 2013, Robinson turned down an offer to manage Blackpool FC, a well established Championship and former Premier League team, in favour of his continuing commitment and loyalty towards Milton Keynes Dons, something which endeared him to the fans of the club. Robinson was linked to other former Premier League clubs including Birmingham City, Sheffield United and Leeds United, and eventually managed Charlton Athletic in 2016-18 after leaving Milton Keynes before moving on to Oxford United. Notable former coaches include Robbie Fowler, former German international Dietmar Hamann and former Arsenal player Ian Wright. Former Manchester United and England international Alan Smith was signed as a player, however was often assisting manager Karl Robinson during matches and would manager the reserve side on occasion, and went to take on a player-coach role at Notts County in May 2014. Similarly Alex Rae, former top-flight player, joined the Dons in July 2009 on a temporary basis with a view to a permanent deal, as first team coach working under his former Wolves team-mate Paul Ince, however he did make three appearances as a player for the Dons. Rae left 29 October 2010, following Paul Ince to Notts County, as an assistant manager, a role which he fulfilled until 3 April 2011 when he left the club following the departure of manager Ince. Record transfer fee paid: Kieran Agard – undisclosed, 11 August 2016. Main article: Milton Keynes Dons L.F.C. The club founded a women's association football team in 2009. They operate as part of the club with an identical badge and strip, and as of the 2018–19 season, the team share Stadium MK as their home stadium with their male counterparts, one of the first clubs in the country to do so. They compete in the FA Women's National League South. ^ "WebCHeck". London: Companies House. Archived from the original on 29 December 2008. Retrieved 17 February 2015. ^ a b "The Accord 2006" (PDF). Sunderland: Football Supporters' Federation. 2 October 2006. Retrieved 17 February 2015. ; "MK Dons agree to return Wimbledon trophies to Merton—and sanction amendments to football statistics" (PDF). Sunderland: Football Supporters' Federation. 29 June 2007. Retrieved 17 February 2015. And, on behalf of both clubs, the FSF respectfully requests that, with immediate effect, our media colleagues now refer to MK Dons in relation ONLY to matches played since their first Football League fixture was fulfilled against Barnsley on August 7, 2004. ^ "Five reasons why MK Dons would be a great first job for Steven Gerrard". ITV News. 18 November 2016. Retrieved 6 February 2018. ^ a b Samuel, Martin (6 February 2013). "Small is beautiful at Milton Keynes...and it could make us play like Brazil". Mail Online. Retrieved 17 January 2018. ^ Osborne, Chris (27 September 2013). "MK Dons: A decade of football in Milton Keynes". BBC Sport. ^ "History in Milton Keynes". MK Web. Cambridge: Iliffe News and Media Limited. Retrieved 9 May 2010. ^ Southgate, Robert (5 April 1973). "Interview with Rodney Stone". The Kentish Independent. London. ; "Programme Notes". Charlton Athletic match programme. Charlton Athletic F.C. : 2. 14 April 1973. ^ "Luton Town 1 MK Dons 0". When Saturday Comes. June 2005. Retrieved 22 November 2010. Thus the spectre of Luton moving to Milton Keynes has been raised regularly over the years, but the opposition of either the fans (vehement) or the Football League (ironic, given that it was on the basis of a club moving out of its area) always came to the rescue. ^ a b Noades, Ron (1 April 2001). "I looked at MK in the 70's". BBC. Retrieved 30 May 2009. ^ a b c Roach, Stuart (2 August 2001). "Too big for their roots". BBC. Retrieved 31 August 2009. ^ Neville, Conor (18 September 2014). "Balls Remembers: The Complete Story Of How Dublin Almost Got A Premier League Team". Balls.ie. Dublin: Balls Media Ltd. Retrieved 17 October 2014. ^ Shaw, Phil (12 June 1997). "Hammam sells up without moving out". The Independent. London: Independent News & Media. Retrieved 31 August 2009. ^ a b Bose, Mihir (16 August 2001). "Hammam cast in villain's role as Dons seek happy ending". The Daily Telegraph. London: Telegraph Media Group. Retrieved 31 October 2009. ^ Wallace, Sam (2 August 2001). "Wimbledon on move to Milton Keynes". Daily Telegraph. London: Telegraph Media Group. Retrieved 20 November 2014. ^ a b Cloake, Martin (29 August 2014). "Why MK Dons' 4–0 victory over Manchester United didn't cause universal joy". New Statesman. London. Retrieved 29 November 2014. ^ a b c Conn, David (27 November 2012). "Peter Winkelman: 'I'm not proud of how football came to Milton Keynes'". The Guardian. London: Guardian News and Media. Retrieved 29 November 2014. ^ Willacy, Gavin (February 2007). "Relocation, relocation". When Saturday Comes. Retrieved 1 November 2009. ^ "Move or die: 'A whole raft of us believe it is better to live, even if somewhere else'". The Independent. London: Independent News & Media. 10 November 2002. Retrieved 31 August 2009. ^ a b Parker, Raj; Stride, Steve; Turvey, Alan (28 May 2002). Report of the Independent Commission on Wimbledon F.C. 's wish to relocate to Milton Keynes (PDF). The Football Association. pp. 17–18, 61–67. Archived from the original (PDF) on 19 November 2004. Retrieved 5 June 2009. The proposal has met with considerable opposition, and not just from the WFC fans. ... [M]ost of the hundreds (over 600) of communications we have received have argued against the proposal. They have generally been from individual WFC fans. 57. Supporters' associations and individual fans from many other clubs and people from as far afield as the United States, Australia (Wimbledon Supporters Downunder), Russia and Norway have also expressed similar views. ... The fans are not of the opinion that a club in Milton Keynes is better than no club at all. ; "Dons get Milton Keynes green light". BBC. 28 May 2002. Retrieved 31 August 2009. ^ Parker, Raj; Stride, Steve; Turvey, Alan (28 May 2002). Report of the Independent Commission on Wimbledon F.C. 's wish to relocate to Milton Keynes (PDF). The Football Association. pp. 1, 9–34. Archived from the original (PDF) on 19 November 2004. Retrieved 5 June 2009. ^ "Dons could move during season". London: BBC. 5 July 2002. Archived from the original on 19 November 2004. Retrieved 30 November 2014. ^ "Confusion mounts over Don's home ground". London: BBC. 3 July 2003. Archived from the original on 11 March 2005. Retrieved 30 November 2014. ^ "Winkelman will still back Dons". London: BBC. 15 July 2003. Archived from the original on 11 March 2005. Retrieved 30 November 2014. ^ "Wimbledon 2–2 Burnley". London: BBC. 26 September 2003. Retrieved 17 November 2014. ; "It's mooing not booing". London: BBC. 27 September 2003. Archived from the original on 11 March 2005. Retrieved 1 December 2014. ^ "Wimbledon to change name". BBC. 21 June 2004. Retrieved 5 June 2009. ; "Wimbledon become MK Dons FC". The Guardian. London: Guardian News and Media. 21 June 2004. Retrieved 4 June 2009. ^ Mitchell, Kevin (8 August 2004). "McLeod gives Dons sense of identity". The Guardian. Retrieved 30 January 2016. ^ "Murdoch axed by Dons". BBC Three Counties. 10 November 2004. Retrieved 30 January 2016. ^ "MK Dons part company with Wilson". BBC Three Counties. 11 May 2006. Retrieved 30 January 2016. ^ a b c "Baggies confirm Di Matteo as boss". BBC Sport. BBC. 30 June 2009. Retrieved 11 September 2013. ^ a b c "Ince reappointed as MK Dons boss". BBC. 3 July 2009. Retrieved 3 July 2009. ^ Bob Williams (16 April 2010). "Paul Ince announces that he will leave MK Dons at the end of the season". Telegraph.co.uk. ^ "Dons spring surprise by appointing Robinson as new boss". BBC. 10 May 2010. Retrieved 10 May 2010. ^ a b Osborne, Chris (26 August 2014). "Milton Keynes Dons 4-0 Manchester United". BBC Sport. ^ "Milton Keynes Dons 6–0 Colchester United". BBC Sport. ^ "MATCH REPORT: MK Dons 7 – 0 Oldham – Christmas comes early at stadiummk". OneMK. ^ a b "Crewe Alexandra 0–5 Milton Keynes Dons". BBC Sport. ^ "Milton Keynes Dons 5–1 Yeovil Town". BBC Sport. ^ "Milton Keynes Dons 1–4 Brentford". BBC Sport. 23 April 2016. Retrieved 24 April 2016. ^ "Karl Robinson: MK boss leaves club 'by mutual consent' after six years in charge". BBC Sport. 23 October 2016. Retrieved 23 October 2016. ^ "Robbie Neilson: Hearts head coach completes MK Dons move". BBC. 2 December 2016. Retrieved 15 November 2018. ^ "Milton Keynes Dons 3-1 Charlton Athletic (aet)". BBC. 13 December 2016. Retrieved 15 November 2018. ^ "Milton Keynes Dons 1-0 AFC Wimbledon". BBC. 10 December 2016. Retrieved 15 November 2018. ^ "Milton Keynes Dons 5-3 Northampton Town". BBC. 21 January 2017. Retrieved 15 November 2018. ^ Pilnick, Brent (30 December 2017). "EFL: Tony Pulis has a tough start while nine-man MK Dons hang on for a win". BBC Sport. ^ "Farcical refereeing doesn't dampen Dons' spirit - Neilson". Milton Keynes Citizen. 30 December 2017. ^ "Milton Keynes Dons 1-0 Peterborough United". BBC Sport. 30 December 2017. ^ "Robbie Neilson: Milton Keynes Dons manager leaves club by 'mutual consent'". BBC. 20 January 2018. Retrieved 15 November 2018. ^ "SACKED: Robbie Neilson leaves MK Dons". Milton Keynes Citizen. 20 January 2018. ^ "Dan Micciche: MK Dons part company with manager". BBC. 22 April 2018. Retrieved 15 November 2018. ^ "Premier League and Football League: Ups & downs and European qualification". BBC. 28 May 2018. Retrieved 15 November 2018. ^ "Paul Tisdale: MK Dons appoint former Exeter City boss as new manager". BBC. 6 June 2018. Retrieved 15 November 2018. ^ "MK Dons and Suzuki GB keep the ball rolling for three more years". Milton Keynes Dons. 7 September 2018. Retrieved 7 September 2018. ^ "Dons open stadium against Chelsea". BBC. 19 July 2007. Retrieved 12 November 2018. ^ "The Queen visits Milton Keynes". BBC. 30 November 2007. Retrieved 12 November 2018. ^ "Winkelman can't guarantee arena!". Milton Keynes Citizen. 26 November 2008. Retrieved 12 November 2018. ^ "MK Dons: A decade of football in Milton Keynes]". BBC. 27 December 2013. Retrieved 12 November 2018. ^ "World Cup 2015 will use only two traditional club rugby grounds". The Guardian. 2 May 2013. Retrieved 12 November 2018. ^ Ben Barrett. "PREVIEW YEOVIL TOWN V MK DONS". ^ a b c "Notable fans". MKDSA. Archived from the original on 14 November 2014. ^ "Hundreds attend the funeral of British IndyCar driver Dan Wheldon". BBC Sport. ^ "Rule changes from League's AGM". The Football League. Archived from the original on 18 February 2007. Retrieved 16 September 2008. ^ Accord on patrimony of Wimbledon FC MKDSA website. ^ "BBC SPORT – Football – My Club – Milton Keynes – Merton given back Dons trophies". ^ "MK Dons 2–1 AFC Wimbledon". BBC Football. 2 December 2012. Retrieved 3 December 2012. ^ Osbourne, Chris (13 August 2014). "MK Dons 3–1 AFC Wimbledon". BBC Football. Retrieved 13 November 2014. ^ Kirk, Scott (12 August 2014). "Football: Heel of God Two helps MK Dons beat AFC Wimbledon in grudge match". MKWeb. Cambridge: Iliffe News and Media Limited. Retrieved 13 November 2014. ^ "MK Dons 2–3 AFC Wimbledon". BBC Football. 7 October 2014. Retrieved 13 November 2014. ^ "Milton Keynes Dons 1–0 AFC Wimbledon". BBC Sport. 10 December 2016. Retrieved 10 December 2016. ^ "AFC Wimbledon: EFL drop charges after club refused to use MK Dons' full name". BBC Sport. 17 April 2018. Retrieved 28 February 2019. ^ Sam Green (18 December 2006). "Card game riles Wycombe". The Daily Telegraph. ^ "MK Dons 2–3 Wycombe". BBC Sport. 17 April 2010. ^ "Football v Homophobia". Football v Homophobia. ^ "MK Dons chairman receives Honorary Doctorate from The Open University". The Open University. 6 June 2013. Retrieved 18 December 2018. ^ McIlroy, Thomas (6 October 2017). "BRITT OF ALRIGHT Who is Callum Brittain? MK Dons' latest prospect tipped to become the 'next Dele Alli'". The Sun (UK Edition). Retrieved 17 January 2018. ^ "Dele Alli: Tottenham sign £5m MK Dons midfielder & loan him back". BBC Sport. ^ "Euro 2016 qualifiers: England 2–0 Estonia". BBC Sport. ^ Dawkes, Phil (8 September 2018). "England: Players getting game time - the biggest threat to future?". BBC Sport. ^ Langner, Wolfgang (4 March 2017). "Kevin Danso ist nach seinem Debüt ein gefragter Mann". Augsburger Allgemeine (in German). Retrieved 24 May 2017. ^ "Baum über Danso: "Es ist eine Sensation"" (in German). 24 May 2017. Retrieved 24 May 2017. ^ "Karl delighted with comeback kids". Milton Keynes Dons F.C. Retrieved 11 August 2016. ^ "First Team". Milton Keynes Dons F.C. Retrieved 24 August 2018. ^ "End of Season Awards Sponsored by Carey Pensions". Mkdons.com. ^ "Milton Keynes Dons cancel awards for first-team players". BBC Sport. 27 April 2018. ^ "As it happened: Player of the Year Awards". Mkdons.com. ^ "MK Dons Player of the Year Awards 2014". Mkdons.com. ^ "George's Player of the Year glee". Mkdons.com. 7 May 2017. ^ "Williams named Player of the Year". Mkdons.com. ^ "Player of the Year Baker wants promotion". Mkdons.com. Retrieved 28 February 2019. ^ "HEEL OF GOD: It's two years on from when Jon Otsemobor scored magical goal for MK Dons against AFC Wimbledon". OneMK. Archived from the original on 25 March 2015. Retrieved 7 June 2015. ^ "Fans' favourite Bullard calls time on injury-hit career after spells with Fulham, Wigan and Hull". ^ "MK Dons sign Dietmar Hamann as player-coach". BBC Sport. 20 May 2010. Retrieved 20 May 2010. ^ "Balanta back but Doumbe is ruled out". Milton Keynes Citizen. 2 August 2011. ^ "MK Dons bring in striker Clinton Morrison". BBC Sport. 24 September 2011. Retrieved 24 September 2011. ^ "Soccerbase – The Internet Soccer Database". Soccerbase. Archived from the original on 26 December 2008. Retrieved 3 August 2017. ^ a b "Who's Who". Milton Keynes Dons. Retrieved 11 April 2018. ^ "Football Staff". Milton Keynes Dons. Retrieved 11 April 2018. ^ a b "Murdoch takes reins". BBC. 25 June 2002. Retrieved 10 June 2009. ^ a b c "Murdoch axed by Dons". BBC. 8 November 2004. Retrieved 10 June 2009. ^ a b "Wilson named Milton Keynes boss". BBC. 7 December 2004. Retrieved 10 June 2009. ^ a b c d e Richard Rundle. "Football Club History Database – Milton Keynes Dons". Football Club History Database. Retrieved 29 April 2009. ^ a b "Dons appoint new manager". BBC. 27 June 2006. Retrieved 10 June 2009. ^ a b "Allen named new Leicester manager". BBC Whilst Allen had spent a lot of money transforming the team, he continues to receive mixed reviews for his period as manager. Some praised him for prevent successive promotions which many in the football community had expected as well as recruiting key players for the following campaign. However 'long ball tactics', disappointing highly paid signings and failure at the play-offs left others disappointed with his spell. 25 May 2007. Retrieved 10 June 2009. ^ a b "Ince unveiled as new MK Dons boss". BBC. 25 June 2007. Retrieved 10 June 2009. ^ a b "Blackburn appoint Ince as manager". BBC. 22 June 2008. Retrieved 10 June 2009. ^ a b "Di Matteo appointed MK Dons coach". BBC. 2 July 2008. Retrieved 10 June 2009. ^ a b "Manager History for MK Dons (formerly Wimbledon)". Soccerbase. Archived from the original on 3 August 2009. Retrieved 10 June 2009. ^ "MK Dons reject Blackpool approach to speak to manager Karl Robinson". guardian.co.uk. Press Association. 16 January 2013. ^ a b "Club statement: Karl Robinson". Milton Keynes Dons Official Site. 23 October 2016. Retrieved 23 October 2016. ^ "Neilson named MK Dons manager". Milton Keynes Dons Official Site. 2 December 2016. Retrieved 2 December 2016. ^ "Dan Micciche: MK Dons appoint ex-England youth coach as new manager". BBC Sport. 23 January 2018. Retrieved 23 January 2018. ^ "Dan Micciche: MK Dons part company with manager". BBC Sport. 22 April 2018. Retrieved 22 April 2018. ^ "Paul Tisdale: MK Dons appoint former Exeter City boss as new manager". BBC Sport. 6 June 2018. Retrieved 6 June 2018. ^ "Ince makes his mark as assistant is named". Milton Keynes Citizen. 15 July 2009. Retrieved 29 July 2009. ^ "History – Milton Keynes Dons". Milton Keynes Dons. Retrieved 1 January 2018. ^ "MK Dons 1 Chelsea 5, FA Cup match report". Telegraph. Retrieved 1 February 2016. ^ "Football: QPR 2 MK Dons 4 – historic FA Cup victory as Dons send Premier League QPR out". OneMK. Archived from the original on 21 February 2015. Retrieved 21 February 2015. ^ "Peterborough Utd 2 – 0 MK Dons (19/05/2011) – UpThePosh! The Peterborough United Database". ^ "Story of the Dons 2004–2010". MK Dons Supporters Association. Archived from the original on 10 April 2014. ^ "BBC SPORT – Football – Grimsby 0–2 MK Dons". ^ a b "Milton Keynes Dons 7–0 Oldham Athletic". BBC Sport. ^ "BBC Sport – Football – Hartlepool 0–5 MK Dons". ^ "Milton Keynes Dons 0–5 Burnley". BBC Sport. ^ "BBC Sport – Football – Carlisle 5–0 MK Dons". ^ "Latest MK Dons Results, Fixtures & Betting Odds – Soccer Base". ^ "Huddersfield Town 5–0 MK Dons – League One – Football – Sports Mole". ^ "Hartlepool 5 – 0 MK Dons – Match Report & Highlights". SkySports. ^ "MK Dons 1–3 Barnsley". BBC Sport. ^ "Milton Keynes Dons 1–2 Sheffield United". BBC Sport. ^ "MK Dons 6–0 Nantwich Town". BBC Sport. ^ Shepka, Phil (31 January 2016). "Milton Keynes Dons 1-5 Chelsea". BBC Sport. ^ a b "Milton Keynes Dons 0–6 Southampton". BBC Sport. ^ "BBC Sport – Football – Hereford United 1–4 MK Dons". ^ "Report: Yeovil Town 4–1 MK Dons". Milton Keynes Dons Official Site. 6 December 2016. Retrieved 6 December 2016. ^ "Report: Norwich City 4–1 MK Dons". Milton Keynes Dons Official Site. 8 November 2016. Retrieved 8 December 2016. ^ "MK Dons 6–1 Cambridge City". BBC Sport. ^ "Dean Lewington". Milton Keynes Dons FC. Retrieved 14 November 2017. ^ "FOOTBALL: Rising star Giorgio Rasulo is making his mark". Oxford Mail. ^ "Dele Alli: Tottenham sign £5m MK Dons midfielder & loan him back". Retrieved 29 August 2016. ^ "Agard arrives". Retrieved 29 August 2016. ^ "Honeyman delighted after Stadium MK is named Ladies base". Milton Keynes Dons. 25 July 2018. Retrieved 25 July 2018. 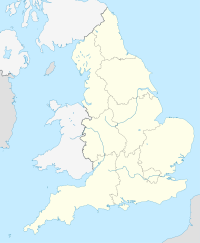 ^ In terms of its footballing assets and place in the English football league structure, Milton Keynes Dons F.C. is the continuation of Wimbledon F.C., which was formed in south London in 1889 and relocated to Milton Keynes in 2003. The club was brought out of administration in 2004 as a new company, Milton Keynes Dons Ltd, which purchased the assets of The Wimbledon Football Club Ltd and received the team's place in Football League One. The Wimbledon Football Club Ltd legally endured until 2009. Since 2006 Milton Keynes Dons has officially considered itself a new club, formed in 2004—it no longer claims any history before then, despite retaining Wimbledon F.C. 's "Dons" nickname. ^ The club abandoned its claim to any history before 2004 in October 2006 as part of an agreement with the Football Supporters' Federation, which had previously boycotted the team and its supporters' groups. Under this deal Milton Keynes Dons transferred Wimbledon F.C. 's trophies and other patrimony to Merton Council in south London in 2007. ^ For a full description of positions see Football positions. ^ Dean Lewington played for Wimbledon before the club was renamed in 2004. The date of Milton Keynes Dons's first league match, 7 August 2004, was agreed in 2006 to be the date on which Lewington ceased to play for Wimbledon and began to play for Milton Keynes Dons. ^ Stuart Murdoch was the manager of Wimbledon before the club was renamed in 2004. The date of Milton Keynes Dons's first league match, 7 August 2004, was agreed in 2006 to be the date on which Murdoch ceased to manage Wimbledon and began to manage Milton Keynes Dons. Wikimedia Commons has media related to Milton Keynes Dons.